No sooner do you climb the steps, wipe the sweat from your brow and look around for an Evian vending machine than you get attacked. The two statues flanking the door react to the presence of the Sealed Book. They awaken when you examine the door. This battle can either be difficult or easy. The trick to defeating the pair is to attack both Gargoyles simultaneously. If you kill the gargoyles singly they just keep reappearing with full hp. The problem arises when you whittle the Gargoyles hp down unevenly. You might as well restart the battle if you accidentally begin attacking one and not the other. You’ll be stuck in an endless cycle of death and rebirth unless you can kill them both in one shot. So, steer clear of the muscular heavy-weapon wielding jobs and opt for the flowing-robe wand-waving variety. The Gargoyles don’t have any specific weaknesses, but magic attacks serve you well. Anything that hits multiple targets will do. Opt for level 5 black magic spells for around 1,100 points of damage. Equip the appropriate elemental wand for an extra 500 points of damage. If you simply must use a physical character, throw skills with a ninja for about 1,300 points of damage. You shouldn’t suffer too much damage in this fight. For all their ferocious looks, the pair only hits for about 450 points of damage to front row party members and 150 to the back row. They should be long dead before inflicting too much damage. Your best friend throughout these halls is a bard crooning Requiem Song. This is a pyramid, and like most pyramids it comes replete with undead creepy crawlies, and of course mummies. The halls are booby-trapped, full of pitfalls, poisonous spikes, shifting walls and floors, and hidden passages galore. There are a few blue magic-casting monsters here if you’ve missed some spells. You can learn the elusive L.3 Flare from Archaesaur, who lies in wait in a couple treasure chests, though you’ll have to control and reflect him to learn it. You can learn Condemn or Guard Off from Cursed Ones, also in many chests, by controlling them. If you haven’t learned Blowfish, BlandLamia is all too happy to cast it on a member of your party. You can learn Dark Shock or GuardOff from the Niles that roam the halls, but you’ll have to give them some mana back with an Ether or Elixir for them to cast the spells. The MachinHead gets in on the blue magic casting with Missile and Emission. By the time you subdue the last robot you’ll wish they didn’t cast them. If you haven’t learned ??? ?, you can control the MachinHead and learn it as well. If you encounter ZephyrZone and she calls a Lunenta into action you can learn L.3 Flare. He loves to cast it without prompting. But if you feel like controlling Lunenta you have another shot at learning ????. Brush yourself off and run (don’t walk) to the treasure chest on your left. Open it gingerly. Monsters lurk inside, a flock of Cursed Ones. After defeating them (beware they hit kind of hard) you gain another Ice Shield. There’s nothing else of note in this room, but on your way out you may notice a pair of Aspis slithering around the exit. They’re weak to ice, so send a shiver down their length and be on your merry way. After removing the sand from all major creases and crevices walk back upstairs. The only path available wraps southward. Before entering the tempting doorway you glimpsed on your path southward. Ignore the blue button for. Walk north and enter the door. If you don’t have a thief, or someone with the Passages ability this room may seem like a dead end. Each of the pillars has a small gap. The room is booby trapped too. When you step on the top square to the left of the first pillar you’ll release a pair of Aspis. You know the trick, a little ice or a verse from the Requiem song and they’re done for. You emerge back on the first floor in a small alcove. Its only ornament is a large mummy casket. Of course it’s not just for ornament. Step up to the coffin and after you’ve been frightened, show that GrandMummy who’s boss. Though he looks scary, the GrandMummy is a pussycat. He attacks physically for around 260 points of damage. That failing he tries Strange Dance, which has the unfortunate effect of putting a team member to sleep. You can easily kill him in a myriad of ways. Several of these will even kill him in one hit. A black mage equipped with a Fire Rod casting Fire3 will inflict about 7,000 points of damage. Mind you, the GrandMummy only has 6000 hp. A mystic knight armed with a Fire3 enchanted sword kills the mummy instantly. If you’d like to draw the battle on through more than one hit, Requiem Song only causes about 2,000 points of damage. The ninja’s Flame Scroll scorches for 2,700 points of damage. You can hit him with L.3 Flare for 2,800 points of damage. You can hit him with the Flame Tongue for 4,000 points of damage. At the conclusion of the battle you gain 5 abp and a HiPotion. Inside the sarcophagus is a small room, which contains a single chest. I’m not sure if the item within should be considered a treasure; it is the Cursed Ring. While the Cursed Ring has an excellent 25 def and 5 mdef, its drawback is that it puts its wearer on a constant countdown to death. Whether you decide the risk is worth the risk. Now backtrack to the beginning of the Pyramid. That blue switch I had you ignore earlier stops the flow of sand to the basement. You can cross safely. The door to the left of the entrance (that I also had you ignore earlier) is your next destination. Pass through it and enter the stairs to the north. This is yet another booby-trapped room. As soon as you pass beneath the first door, it slams shut. Two Aspis spring from the wall. Defeat them and then deal with more pressing matters, like which switch will get you out of this room. The left switch opens the bottom door. The middle switch opens the top door. The right switch opens the middle door allowing you to continue. 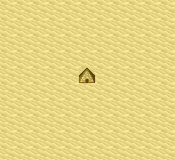 The first thing you see when you enter the floor is a cluster of three treasure chests directly north. You’ll have to fight for your treasures. All of the chests contain monsters. The chest to the right contains a White Suit. This suit increases your little magician’s mpwr by 3, and vit by 3. The middle chest yields a piece of Dark Matter. The left chest reveals a Flame Shield, which you may have chosen back at Mua Forest. You probably didn’t notice, since you were caught up in your looting, that two more Aspis popped out of a whole in the wall. Defeat them and continue east. The path to the exit has a catch, or rather a slide. Time your passage well and you’ll avoid the spikes. Time it poorly and your party lands on the spikes below, takes damage, and is poisoned. This is perhaps the most perilous floor in the Pyramid. It swarms with mechanical monsters eager to challenge you. There are no random encounters, but you should have enough trouble with the MachinHeads. They dart back and forth across the floor and are virtually unavoidable. Learn to fear these gearboxes scuttling across your path. These ones aren’t too bad, but somewhat later you’ll find another one…and he is quite possibly the most difficult monster in the game. I’m talking about Omega, but I digress. The Machinheads use various attacks. Occasionally they just fight doing insignificant damage, but more often they use nasty attacks like Surge Beam, which inflicts damage equal to ½ of max hp to all party members and causes hp to drain. That failing he uses the blue magic spell Missile and cuts a single target’s hp to ¼. Slightly less nasty is another blue magic spell, Emission. It only inflicts 150-200 points of damage, which can be absorbed by a Flame Ring or Flame Shield. You may also be unlucky enough to be hit by Mustard Bomb. This spell deals 300 points of damage to its target and causes hp to drain. Just for kicks MachinHead uses Dynamo. All it does is change the row of a any or all party members. As a strange note, if you use Jump MachinHead counters with Interceptor Rocket, which causes the Jump attack to fail. These guys can be quelled with a single hit from a Bolt3 enchanted sword. You should be so lucky with Omega. If you feel like toying with the robot a bit you can just cast Bolt3 with your trusty black mage—sans Thunder Rod— for about 5,100 points of damage. If you equip the Thunder Rod he should be dead in one hit. You can also break Thunder Rods for about 5,300, but that’s a waste. It’s more effective to just cast Bolt3. You might also fling Thunder Scrolls. They deal around 3,000 points of damage. I don’t believe he’s actually weak to water. Don’t even contemplate casting Aqua Rake. It doesn’t even do 700 points of damage. Ramuh is rather weak as well dealing only about 2,000 points of damage. Thunder Bows are even worse at 1,200 points of damage. If all else fails there’s always good old !Gil Toss for 3,000 points of damage. To the left the blue button is a double-edged sword. It removes the spikes, but also releases a pair of Aspis, which invariably slither in your path. After squashing their resistance run up the path to the left. Don’t be too eager to open the chest. There are monsters within. After defeating them, you gain a Black Suit. The suit is a wonderful piece of clothing for whatever mage you have aiding you. It increases mpwr by 5, 2 more than the White Suit you jut found. Unlike the White Suit, it doesn’t increase vit at all. At the northern end of the room is a sarcophagus with two treasure chests flanking it. The chest to the left contains an Elixir. The chest to the right contains an Elixir. Gods be praised you probably need them desperately at this point. As an added bonus, there are no monsters lurking within those chests. Now for the sarcophagus…of course it’s not empty. This trio isn’t very difficult. Like the GrandMummy, they are weak to Fire and are undead. A Fire3 enchanted sword will kill its target instantly. Otherwise pick your favorite spell of fiery death and pelt away. The Mummies will hit physically for about 160 points of damage. Watch out for their Dance of the Dead attack. When it hits, it converts its target into a zombie. The zombie will then attack its former teammates. Heal the afflicted teammate with a Revivify. A passageway behind the sarcophagus leads to a treasure chest. Like the chest behind the last sarcophagus, this one is sort of a mixed blessing. It contains a Thornlet. While it boasts the highest defense of any helmet in the game, it decreases mpwr by 5 and while it is equipped the wearer’s hp gradually drain. Not all that glitters is gold. Having gotten all of the bounty it’s time to make an exit. A sarcophagus housing a trio of mummies blocks your path to the exit as well. You know what to do. After dispatching them you can safely continue to the next room. It’s about time for a save point! Use it, as well as a tent or cabin before continuing to the Fifth floor. Ignore the desire to immediately explore the secret passages to the right of the entrance (assuming you see them with the Passages ability). Instead of going through the gaping sarcophagus, weave around to the left and north. Along the way you will probably meet a unique enemy: Sekmet. He’s not too tough weighing in at 6,000 hp, but he doesn’t have any inherent weaknesses. For the discerning kleptomaniac, Sekmet’s rare steal is a Thief Glove. This is the second of three in the game, but it takes a little effort to nab it. Most often you’ll end up with a lousy HiPotion. Bring along a time mage to cast Reset each time you get a HiPotion. Eventually (and it may take quite a few tries) you’ll gleefully latch onto a Thief Glove. Be warned, Sekmet’s only attack is Swing. He sometimes hits multiple times for 300-650 points of damage and it often inflicts darkness. If you’re lucky, he’ll drop Crystal Armor. If you he doesn’t drop it don’t fret. You’ll get a suit in a moment. Just when you think you’re in the clear and ready to climb the stairs, another pair of Aspis arrives. Kill them and then run upstairs. Just what you need: another snake-infested room. I don’t think Indiana Jones had to face so many. You know the drill, hack and slash. Both treasure chests are monster filled. Before you open the chest to the right you may want to equip someone with the !Blue ability. The right chest contains a familiar bunch of Statues. Since you’ve only got three party members it’s easiest to dispatch them all in one fell swoop by casting L.5 Doom. They leave behind a handsome suit of Crystal Armor. Equip it before trying your luck with the other chest. The left chest yields Dark Matter after you evict its inhabitants, a quartet of Cursed Ones. Now it’s time to explore those passages to the east. Unfortunately you can’t get through the northeastern door. Don’t worry too much about it. You’ll get back to it. Instead head all the way south and enter the passage. Head north at the first turn. There’s nothing to the east. Continue until you come to the middle treasure room. This treasure chest is also host to monsters. When you open it three Fall Guards attack you. These guys can hit for massive damage: over 5,000. Don’t toy with them just hit hard and fast and you should be fine. After surviving the fight, you’ll gain a Dark Suit. With a def of 17, this light armor is second only to the Rainbow Dress (only equipped by Dancers). In addition to its great defense it raises str and agi by 1. Unfortunately its mdef is somewhat lacking, but you can’t have everything. From this perspective you glimpse the treasure chest north lying just out of your reach. Let’s go get that now. Exit the passages and ascend the southern staircase. Before cutting the flow of sand ride it down. You’ll land back on the fifth floor in the sandbox to the right of the elusive chest. Yes, there are monsters in that one too. They’re just a bunch of Cursed Ones. Sing them to death with Requiem, or an attack of your choice and claim the Dark Matter. Having claimed the last treasure on the fifth floor, it’s safe to press the button to the left of the first sandfall allowing safe passage. Walk across it and continue past the next switch. Enter the door on the right. This strange room holds for treasures, and you have a 50% chance of getting them on the first try. There are two blue switches. Press the right one and you’ll get shoved off of the floor, onto a sandfall and hurtled down to the fifth floor. Press the left switch and the wall recedes allowing access to all of the treasure. Grab the two chests to the right first. There are no monsters guarding them. Open the left chest for 9,000 Gil. Open the right for 8,000 Gil. Both chests on the left contain monsters. You’ll have to fight off Cursed Ones in order to receive your treasures. The left chest contains Dark Matter. Surprise! The right chest holds Dark Matter as well. Don’t forget to press the next two blue switches to stop the flow of sand. Riding those sandfalls won’t take you to treasure, they will just land you back on the fifth floor in the other two rooms with sandpits. Walk eastward and climb the stairs. The seventh floor is divided into three distinct sections, a central staircase and two paths flanking it. Ignore the right path—closest to your entrance—it only leads to a dead end. Instead follow the left path to its end. From there, tiptoe left through the passage to the first chest. Since the chest embraces the valuable Earth Hammer, you’ll have to fight Cursed Ones for it. Forge ahead along the passage to gain two more chests. Ignore the door to the center room. You can’t open it from this side. Inside the eastern chests lies a hefty 10,000 Gil. A Cabin is tucked in the southern chest. Neither of them house monsters. After you’ve gotten those treasures, climb the center stairs to reach the eighth floor. You’ll come back for the center chest in a moment. What a lovely trap! Three chests are all in plain sight, but the floor shifts around them. There are only two patterns for the floor to switch to. Take note of the tiles that remain the same and aim for them on your quick runs from chest to chest. The right chest holds a Gold Hairpin, the left a Ribbon, and the center a wonderful Guard Ring. After you’ve gotten all of the treasures, fall through the shifting tiles. You land back on the seventh floor in the previously unreachable area. Pluck an Elixir from the chest exit through the one-way door to the north and hike back upstairs. You have a choice to make, whether to go left or right first. I suggest going right since it dead ends. Scurry from tile to tile as they shift and exit. It’s another room divided. You arrive on the right hand side first because if you try and venture up the center, you’ll slide right back down. You have to go around to the left to proceed, but before you do pick up the contents of the two chests. Neither contains monsters. The chest on the right holds Dark Matter, and the left more money! You’ll pluck 12,000 Gil from it. Once you’ve gotten those, head back out, over the shifting tiles once again and enter the left side. This side mirrors the right. Snag the two chests. The left contains an Elixir. The right you’ll have to fight some Cursed Ones for. After your victory you’ll be granted the final treasure of the Pyramid. Enjoy this last Dark Matter. Now carefully walk up the center stairway avoiding the light colored sections. The light sections act as slides pushing your party back down. This is your final stop in the pyramid. Did you ever think it would end? The culmination of your hard work lies in the center of the room. All you have to do is walk up and grab the first stone tablet. As you heft it, some changes occur. The ground beneath you rises up, up, up until you’re standing outside at the pinnacle of the Pyramid. From your vantage point you witness a peninsula sink into the sea, and from the sea flies the mighty Bahamut. Fear not, this is not yet a boss battle. He entreats you to meet him at North Mountain. With that he flies off, and you spy your ship sailing to shore within reach. You need an “I survived the Pyramid” T-shirt. You have. You should be much richer for it. For Machineheads, if you have mastered Samuri you can use Slash on them to kill in one hit. At least in SNES version this works. X-Fight, A flametounge, and the brave blade all put together made this part of the game scandalously easy... Just an FYI. How do you catch the UFO that flies around the pyramid. Or why it only shows up when I have a party of thieves? You should have mastered many jobs at this time, use a freelancer with brave blade, two hands and rapid fire, it�s about 10000-12000 damage! you must have the Artful Dodger and Mug abilities to one party member so you can first steal the Thief's Gloves (a benefit use for stealing Murasame and other unobtainable weapons and accessories) from Sekhmet. then set the others in the Mimic ability when the first one failed. and don't forget to hit him by using the rapid fire ability and the throw command as well as summon if necessarry. A quick and Easy method to dispatch the Gargoyles is GilToss. If you have a Bard in your party (and you probably will have one due to his Requiem Song), you can use his Charm Song on the Nile monsters every turn and watch them killing each other.